OpenCity is an app that offers a service for local restaurants, like Cinquecento, that allows customers to text directly with their questions and requests. Artificial intelligence doesn’t typically concern itself with the meatball-related matters. But Nick Belsito, the brains behind the new chatbot app Open City, isn’t your typical tech founder. Belsito grew up working at his father’s Worcester deli, toiling alongside his uncles, aunts, and cousins preparing recipes his grandparents brought from Italy. 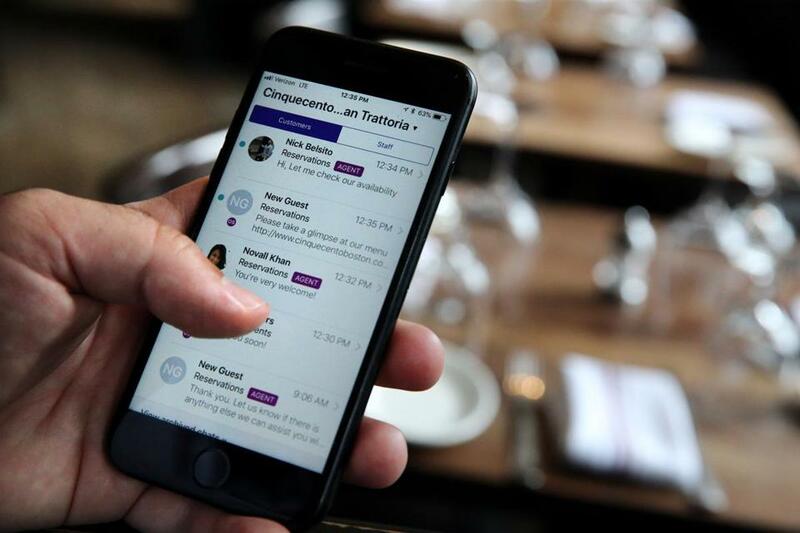 It was watching that all-consuming, day-in-and-day-out slog that is the life of a restaurant owner that eventually inspired Belsito’s Boston-based startup — a communications platform that makes getting in touch with a restaurant as easy as sending a text. “Throughout my startup career I’ve been focused on figuring out how do we create better products that help people like my dad, saving them money and making their lives better,” Belsito says. The company’s aim is to give people in the hospitality industry a simpler way to communicate with customers, letting them handle inquiries, reservations, and complaints in a matter of seconds. Open City’s software creates a special phone number for guests to text their questions, and also plugs into a restaurant’s website, Google search listing, and Facebook Messenger app. When users click on the chat window on their phone or desktop, it serves up a series of prompts: Are you looking for reservations? To message the owner? Want get in touch about an event? Based on your query, Open City either provides responses using artificial intelligence for information like hours of operations, or routes a message directly to the person on staff tasked with handling reservations, events, or other special requests. The restaurant employee can then respond directly to the customer via text. 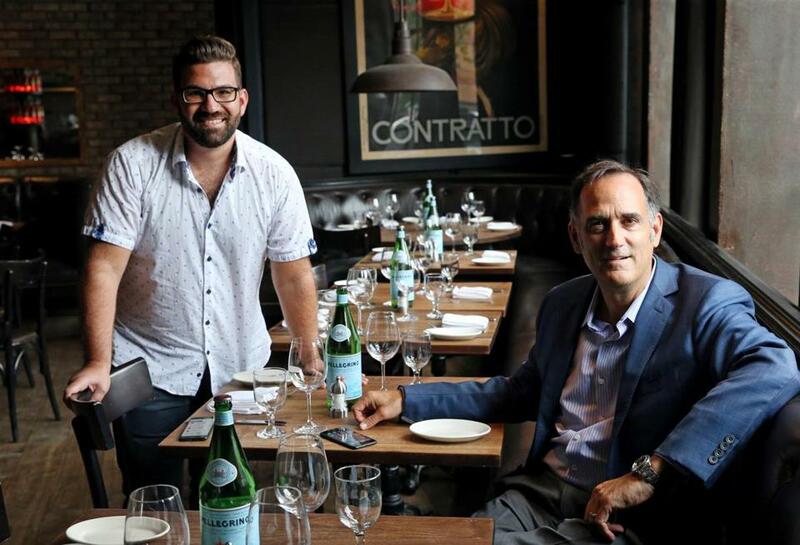 Nick Belsito, (left) CEO of OpenCity, and Jeff Gates, owner of Aquitaine Group, at Cinquecento, where Belsito demonstrated the OpenCity app. Belsito says bringing on a chatbot cuts out the need for having a person on hand to take reservations at a restaurant during off hours — something few restaurants can afford. And giving customers an easy way to text complaints can help owners address concerns faster, meaning disgruntled foodies might be less inclined to log onto Yelp, Twitter, or OpenTable and blast a restaurant for lousy food or service. Owners know that those reviews can hurt the bottom line: A 2011 Harvard Business Review study found that for every star gained on Yelp, a restaurant can generate as much as nine percent more revenue. Open City’s team of 10 has some serious hospitality bona fides: Its chief technology officer worked at OpenTable for a decade, and the company’s head of sales also worked at the reservation booking site before making the jump to HotSchedules, a restaurant management app. Open City’s advisors include Jim Giza, a longtime executive at Kayak. (As it happens, Kayak’s founder Paul English is also in the chatbot game; his Boston-based startup Lola combines human staffers and artificial intelligence to target business travelers.) Open City is working out of the Branchfood food startup incubator at 50 Milk St., and was also one of the first recipients of funding from Branch Venture Group, the incubator’s new venture fund. The app has been operating in beta for the better part of a year, and is being used by several hundred restaurants and nightclubs across the country, including Frenchie wine bistro, and the Royale and Whiskey Saigon nightclubs in Boston. Its public launch took place about two months ago, Belsito says. Jeff Gates, the owner of the Aquitaine Group, rolled out the app for his South End restaurant Cinquecento in May, and now gets three or four texts a day through the service. He says it allows him to meet his customers where they already are, and handle fewer routine phone calls about things like whether the restaurant has gluten-free pasta (they do), giving him more time to focus on his patrons. I got in touch with him to set up an interview using the website’s Open City chatbot, and Gates texted me back within minutes with his cellphone number. Gates says he hasn’t received any negative feedback through the chatbot yet, but he is eagerly awaiting his first burn.